Hunger robs children of their potential to grow and thrive every day. In Guilford County, our hunger statistics are staggering, with 2 of every 3 students needing free or reduced-cost meals at school. For some, this is their only weekday nourishment. It is with your help that we are able to nourish children’s minds and bodies with food and hope for every child through our many programs. Share your photos with us! 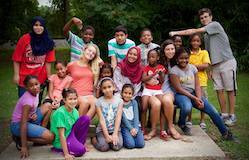 Please send your favorite photos of volunteering at Out of the Garden Project to volunteer@outofthegardenproject.org. Out of the Garden Project partners with over 50 Guilford County schools and provides 1,900 students and their families with food to take home for the weekend every Friday. The goal of Operation Backpack is to ensure children are fed and ready to learn by Monday. 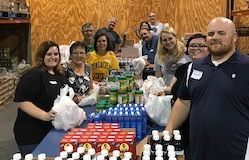 Volunteers are always needed to help sort food as well as pack Operation Backpack meal bags at our warehouse located at the rear of The Church on 68 – join us anytime we’re open (see hours below). Volunteer drivers are also needed to help with weekly Operation Backpack meal bag deliveries to our 50+ partner schools. For questions regarding Operation Backpack and warehouse volunteer opportunities, please contact volunteer@outofthegardenproject.org. To learn more about how you can participate in our Operation Backpack program, please contact don@outofthegardenproject.org or call 336.430.6070 ext. 5. 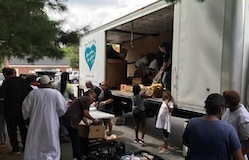 Fresh Mobile Markets are mobile food pantries which distribute fresh produce, bread, meat, and shelf-stable items to qualifying families on a monthly basis throughout 18 locations in Greensboro and High Point. Families can expect to leave a Fresh Mobile Market with at least 65 pounds of food. We currently serve 1,000 families every month. Participating families must qualify by income and are eligible to receive food from a Fresh Mobile Market once a month. In order to receive food, families must first complete a form provided by an Out of the Garden Project representative. To find the Fresh Mobile Market nearest to you, please contact food@outofthegardenproject.org or call 336.430.6070 ext. 6. Out of the Garden Project is excited to introduce our Urban Teaching Farm! Launched in November of 2018 on 3 acres at Prince of Peace Lutheran Church in the Warnersville neighborhood in Greensboro. Our goal is to improve access to fresh foods, offer service learning opportunities, and teach the sustainable skill of farming to the next generation in our community. To support our mission, we are offering memberships in our Harvest Box program Memberships for 2019 are available on a limited basis — first-come, first-served — for a suggested donation of $500. We also have a limited number of Pay What You Can Harvest Box shares available. A weekly box (valued at $21) of 4-8 different kinds of local and sustainably grown vegetables from April 17th-October 9th, 2019. Invitations to monthly community dinners at the farm. An invite to our end of season Fall Harvest Day Celebration in October. For Harvest Box membership questions please contact farm@outofthegardenproject.org or call 336.430.6070 ext. 2. To learn more about volunteer opportunities at the Urban Teaching Farm, please contact volunteer@outofthegardenproject.org or call 336.430.6070 ext. 1. Out of the Garden Project reclaims more than 200,000 pounds of food annually from local grocery stores and businesses and redistributes it to local children and their families. Our food reclamation efforts fight both hunger and food waste in our community! Volunteers are needed to pick up food donations from various grocery stores in Greensboro and High Point and bring them to our warehouse. Generally, these pickups involve 1-6 boxes of food. Volunteers should be able to lift 50 pounds. Please contact volunteer@outofthegardenproject.org for more information on how to become a donation pickup driver for Out of the Garden Project. 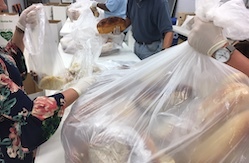 We also need volunteers to help repackage donated bread and sweets at our warehouse. Interested in repackaging some bread and sweets? Please register to volunteer with us. Out of the Garden Project’s Shared-Use Community Kitchen helps local entrepreneurs start and grow their own food-related businesses. Our kitchen can be reserved for use 24/7 for low-risk packaged food production (at $10/hour) and/or cooking classes (at $20/hour). Dry, cold, and equipment storage are also available for a monthly fee. Our Shared-Use Kitchen is a part of Kitchen Connects GSO, an incubator program for local food entrepreneurs supported by a multi-organization partnership and a USDA Local Food Promotion Grant. To make a reservation or for more information on how to apply to the Kitchen Connects GSO incubator program, email kitchen@outofthegardenproject.org or call 336.430.6070 ext. 3. Each summer, Out of the Garden Project partners with Second Harvest Food Bank of North West North Carolina to supply breakfast and lunch to children at Greensboro Recreation Centers. For more information on our Summer Meals Program, please contact don@outofthegardenproject.org or call 336.430.6070 ext. 5.